(OJAI CA – April 17, 2018) – The 72nd Ojai Music Festival, June 7-10, 2018, presents Music Director Patricia Kopatchinskaja’s unbounded musical creativity in the context of today’s social and political climate. The Ojai, Ventura, and Santa Barbara areas continue to replenish from the devastation of the Thomas Fire. The Topa Topa Mountains surrounding the Ojai Valley have already given rise to new growth, and the Festival honors this renewal with new works, debuts, and free community concerts. “When I first met Patricia Kopatchinskaja, I knew she was a natural to be Music Director of the Festival. She is, quite simply, a force of nature. Her unstoppable energy, blazing virtuosity, and relentless curiosity are irresistible.The 2018 Festival will showcase her wildly diverse artistic talents as a violinist, a collaborator, a director, an advocate, and as a creative force. Patricia sees music in the context of today’s social and political issues, so the 2018 Festival is one that will surely offer confrontation, questioning, and healing. The 2018 Festival aims to capture Patricia’s infectious energy and virtuosity,” said Artistic Director Thomas W. Morris. The JACK Quartet also makes its Ojai debut at the 2018 Festival. Deemed “superheroes of the new music world” (Boston Globe), JACK is dedicated to the performance, commissioning, and spread of new string quartet music. Comprising violinists Christopher Otto and Austin Wulliman, violist John Pickford Richards, and cellist Jay Campbell, the group collaborates with composers of our day, including John Luther Adams, Chaya Czernowin, Simon Steen-Andersen, Caroline Shaw, Helmut Lachenmann, Steve Reich, Matthias Pintscher, and John Zorn. Upcoming and recent premieres include works by Derek Bermel, Cenk Ergün, Roger Reynolds, Toby Twining, and Georg Friedrich Haas. At the 2018 Festival, JACK will perform works by Georg Frederick Haas, Horatio Radulescu, Morton Feldman, George Crumb, Jorge Sanchez-Chiong, and John Luther Adams. Major projects will include two semi-staged concerts conceived and directed by Ms. Kopatchinskaja. The first, which opens the Festival on Thursday night, is Bye Bye Beethoven. Ms. Kopatchinskaja describes the concert as a commentary on “the irrelevance of the classic concert routine for our present life.” This program features a mash-up of music by Charles Ives, John Cage, Joseph Haydn, György Kurtág, Johann Sebastian Bach, and the Beethoven Violin Concerto. This marks the US premiere of Bye Bye Beethoven, which was premiered at the Hamburg International Music Festival and subsequently staged in Berlin. This production marked the fourth collaboration between Ms. Kopatchinskaja and the Mahler Chamber Orchestra. Bye Bye Beethoven involves musicians in both conventional and unconventional roles, encounters with different musical genres – including a collaboration with sound designer Jorge Sanchez-Chiong – and discourse among sound, space and imagery. The second semi-staged concert conceived and directed by Ms. Kopatchinskaja is a provocative commentary on the consequences of global warming. Titled Dies Irae, the program is an aesthetic reflection of a time rife with global warming, wars over resources, and refugee crises. Musical selections include Heinrich Ignaz Franz Biber, George Crumb, Michael Hersch, Byzantine chant, Giacinto Scelsi, and Galina Ustvolskaya’s remarkable Dies Irae for eight double basses, piano, and wooden box. The evening performance on Saturday, June 9 marks its American premiere. A new work, I hope we get a chance to visit soon by American composer Michael Hersch – described by him as a dramatic narrative for two sopranos and eight instrumentalists – will receive its world premiere at the 2018 Ojai Music Festival, with subsequent performances at Cal Performances’ Ojai at Berkeley and at Great Britain’s venerable Aldeburgh Festival. Performing in the premiere will be sopranos Ah Young Hong and Kiera Duffy, alto saxophone player Gary Louie, and members of the Mahler Chamber Orchestra conducted by Tito Munoz. Set to poetry and text by Rebecca Elson, Mary Harris O’Reilly, and Christopher Middleton, the new work is commissioned by the Ojai Music Festival, Cal Performances Berkeley, Aldeburgh Festival, and PN Review. Mr. Hersch, who wrote a violin concerto for Ms. Kopatchinskaja two years ago, is considered one of the most gifted composers of his generation. He currently serves on the composition faculty at the Peabody Institute of the Johns Hopkins University. The Friday, June 8 premiere follows works by Carl Philip Emmanuel Bach, Jorge Sanchez-Chiong, and piano music by Bull, Byrd, and Purcell performed by Anthony Romaniuk. Featured on Friday afternoon (June 8) will be the music of Russian composer Galina Ustvolskaya, described by Alex Ross as “one of the century’s grand originals.” Kopatchinskaja has long been a passionate advocate of Ustvolskaya’s music and will perform her Duet and Sonata with pianist Markus Hinterhäuser. Hinterhäuser, who is also the Intendant of the Salzburg Festival, will perform all six of her piano sonatas. Ustvolskaya’s powerful Dies irae will be featured in the Saturday evening concert of the same title. The 2018 Festival continues to build on its commitment to reach broader audiences with several opportunities for all to experience Ojai offerings. 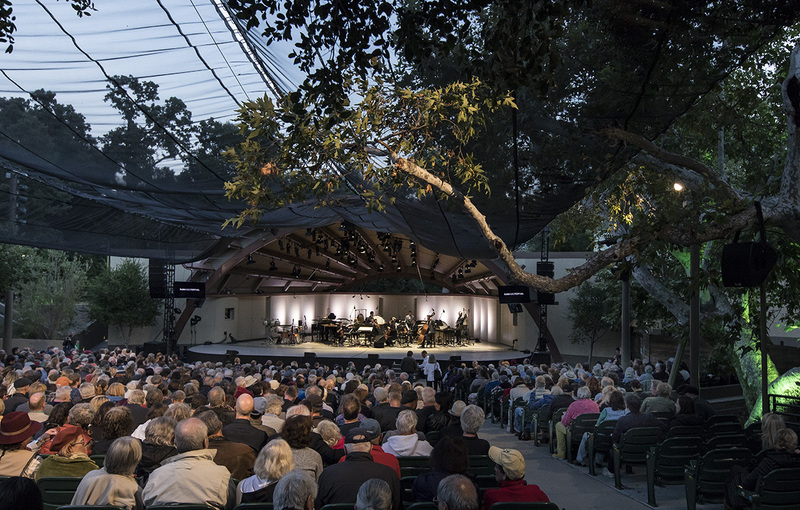 On Thursday June 7, following the three-part Ojai Talks dialogues, the Festival commences the first in a series of five free concerts in the Gazebo of Libbey Park, featuring performances of Luciano Berio’s Sequenzas for solo instruments performed by members of the Mahler Chamber Orchestra. On Saturday morning (June 9), Viktor Koptachinsky will perform in works for cimbalon at the Gazebo hosted by his daughter Patricia and Artistic Director Thomas W. Morris. Ms. Kopatchinskaja and Jorge Sanchez-Chiong, electronics, will perform Luigi Nono’s La lontanaza nostalgica utopia futura in a free concert on Thursday evening in Libbey Park, preceding the Festival’s first main Libbey Bowl concert of Ms. Kopatchinskaja’s semi-staged concert Bye Bye Beethoven. Additional on-site and on-line dialogue during the 2018 Festival includes Concert Insights, the preconcert talks at the LIbbey Bowl Tennis Courts with Festival artists hosted by resident musicologist Christoper Hailey. Preconcert interviews are broadcast through the Festival’s free live streaming program. Following the 2018 Festival in Ojai with Music Director Patricia Kopatchinskaja and the following week’s Ojai at Berkeley presented in collaboration with Cal Performances, a new partnership with Aldeburgh will take place at the end of the Aldeburgh Festival (June 20 – 23) based at the acclaimed Maltings Concert Hall and in the town of Snape near Aldeburgh in England. The collaboration with Aldeburgh follows the formation of Ojai at Berkeley as a partnership of co-productions and co-commissions that affords the Ojai Music Festival, the Aldeburgh Festival, and Cal Performances the ability to present more complex and creative artistic projects than could be conceived by each partner separately. The Aldeburgh relationship launches in June 2018, for an initial four-year period. Ms. Kopatchinskaja’s (Ko pat chin sky yah) 2017/18 season commenced with the world premiere of her new project Dies Irae at the Lucerne Festival where she was ‘artiste étoile’. The second staged program which follows the success of Bye Bye Beethoven with Mahler Chamber Orchestra in 2016, is conceptualized using a theme from the Latin Requiem Mass and features music from composers such as Scelsi, Biber and Ustwolskaja. The North American premiere will take place at the Ojai Festival in June 2018 where she is Music Director. Ms. Kopatchinskaja’s was awarded the prestigious Swiss Grand Award for Music in September 2017 and continues to move from strength to strength adding a Grammy award to her list of accolades in the 17/18 Season. The Violinist was presented with the award for Best Chamber Music/Small Ensemble Performance for her disc Death and the Maiden, recorded with the St Paul Chamber Orchestra and released on Alpha Classics. Concert highlights in 17/18 include; performances of Stravinsky’s concerto with Currentzis and the Tonhalle-Orchester Zürich and the same repertoire with Gimeno and the Rotterdam Philharmonic Orchestra. She has played with Mahler Chamber Orchestra under Payare and will perform with Orchestra Sinfonica Nazionale della RAI and Geneva Camerata for Berg’s violin concerto. Chamber music is immensely important to Ms. Kopatchinskaja and she performs regularly with artists such as Markus Hinterhäuser, Anthony Romaniuk and Jay Campbell. With pianist, Polina Leschenko she has recorded and released ‘Deux’ for Alpha Classics. Together the duo reimagines the sonatas of Ravel, Poulenc, Bartok and Dohnányi. From its founding in 1947, the Ojai Music Festival has created a place for groundbreaking musical experiences, bringing together innovative artists and curious audiences in an intimate, idyllic setting 80 miles northwest of Los Angeles. The Festival presents broad-ranging programs in unusual ways with an eclectic mix of rarely performed music, refreshing juxtapositions of musical styles, and works by today’s composers. The four-day festival is an immersive experience with concerts, free community events, talks, and gatherings. Considered a highlight of the international music summer season, Ojai has remained a leader in the classical music landscape for seven decades. The Ojai Music Festival continues to draw thousands of curious and engaged music enthusiasts from across the country. As tickets remain in high demand, Ojai includes free access to the Festival experience through live and archived video streaming at OjaiFestival.org. 2018 Festival single tickets are available and may be purchased online at OjaiFestival.org or by calling (805) 646-2053. 2018 Ojai Music Festival single tickets range from $45 to $150 for reserved seating and lawn tickets for $20.